Signing my name in Japanese Sign Language (JSL) for the first time was not easy. Even after I figured out the five signs I needed, it took some practice to gracefully string them together. Luckily my JSL instructor was very patient with me and the rest of the students in my JSL circle as we tried to force our hands into hiragana signs. Yep, I was in Japan… learning Japanese Sign Language. Deafness in Japanese history goes way back. We're talking the Kojiki (one of Japan's oldest Shinto texts) and Japan's Shinto creation myth. (For the uninitiated: there's a god named Izanagi and a goddess Izanami who take it upon themselves to form the islands of Japan). After Izanami and Izanagi create Japan, they figure they need to create baby-gods and goddesses who can enjoy it. The ceremony of god-making involves walking around a pillar and greeting each other. Not too complicated, right? Izanami and Izanagi do what any good parents would and send their leech baby off in a reed boat, never to be seen again. Then, they walk around the pillar once more and get their hellos in the right order. They go on to create a whole slew of Japanese gods, none of which look like bloodsucking worms. But despite being the sole captain and crew of his own reed boat, Leech Baby grows up and becomes Ebisu, the Shinto god of fishermen, merchants and wealth. Not bad for such humble beginnings, eh? Ebisu is usually portrayed as having very large ears, which don't do him a lot of good because he's deaf. This is one of the side effects of being a leech baby, I guess. But don't worry, according to some local customs, you can always bang some pots and pans to get his attention. So you would think with Ebisu being a pretty cool god who happens to be deaf Japan would historically be a decent-ish place for deaf people, right? First of all, there's not much info on being deaf in Japan before the Meiji period. Sign language didn't exist until then, and deaf people were much worse off than other people with disabilities. If you were blind in Japan you could be a shiatsu masseuse, play the koto or the shamisen, or be a money lender. But these sweet gigs didn't exist for deaf Japanese. Instead, most of them performed ordinary manual labor jobs, like farming. In 1862, we know that the Tokugawa Shogunate sent out some envoys to Europe to learn more about deafness by having them visit schools for the deaf. These included Ito Hirobumi, Kaoru Inoue, and Yozo Yamao. Yozo saw deaf girls communicating with sign language while working in a factory, and realized that this could help deaf Japanese people. He went to a few deaf and blind schools in the UK and then, sixteen years later, he helped to build some of the first Japanese schools for the deaf. The very first school was Kyoto Mouain (京都盲唖院), present day Kyoto Prefectural School for the Blind (京都府立盲学校). Denbee Kumagai asked Kyoto Taiken Elementary School if they could try teaching three deaf kids. The school accepted and Tashiro Furukawa was picked to be their teacher. Furukawa taught them yubimoji 指文字（ゆびもじ）, or fingerspelling, and they learned how to pronounce words, read, and write Japanese. His original yubimoji are what evolved into what we use today. He was even featured in a google doodle earlier in 2015. Yozo helped start another school by petitioning to the Grand Council of State in 1871, and the Tokyo Takuzenkai Kunmouin (東京楽養会訓盲院) was founded in Tokyo. And as the Meiji Era progressed, more and more private schools for the blind and deaf were popping up around Japan. In the Taisho Era, blind and deaf schools were separated and deaf schools stopped teaching sign language and switched to lip reading and speaking education known as kouwa 口話（こうわ）. Then, after World War II, when Japan started its compulsory (standardized) education, the education of deaf Japanese got a bit better too. Schools started separating the completely deaf 聾（つんぼ） from the hearing impaired 難聴（なんちょう）. Subdivisions of disabilities were being acknowledged and people with different needs were being addressed. Pretty cool, right? But just because education was spreading, didn't mean deaf people were being treated well. Being deaf was thought of as more of a disease or disability, so if you were deaf you were different. And being different in Japan wasn't a good thing. In fact, we don't even have to reach that far back in time to see some pretty less-than-stellar actions against deaf Japanese people. In 1965, two deaf men were accused of murdering the owner of a sushi restaurant. The defendants, Kido Takashi and Sato Yoshikazu, had been caught in a brawl at the restaurant because some other men made fun of their signing. Long story short, the owner got mad, hit one of them in the face with his sandal (which totally didn't help), the deaf men knocked him down. He died hitting his head on the ground. The hearing men ran off and the two deaf men were stuck with the murder charges. The deaf community, along with Deaf News tried to band together to support the pair, raising money and trying to find interpreters. But the lawyers didn't want to be involved with deaf murderers and interpreters didn't understand legal jargon. So neither of them were provided with interpreters during the police interrogation, had hearing lawyers who couldn't sign. Then, when interpreters were finally allowed, the police argued the interpreters wasn't official legal counsel and decided to listen in while the lawyers and defendants tried to build their case. Both men were sentenced to jail time, Kido, being older, getting a harsher sentence. Finally a man named Matsumoto Masayuki, the first deaf lawyer, came to his rescue and eventually the sentence was lessened. But not because they found him less guilty. Instead it was because they decided he must have been mentally slow. Not much of a victory. JFD vs D PRO: Fight! But things have been getting better. The Japanese Federation of the Deaf was formed in the late 1940s to help Japanese people who are deaf and hard-of-hearing come together and foster a sense of community. It also exists to defend the rights and freedoms of deaf Japanese, like the 1965 murder trials. The JFD's philosophy is that deaf Japanese are just Japanese people who happen to be deaf. This includes people who are hard-of-hearing, deaf since birth, or who use a hearing aids or cochlear implants. However, as with any self-respecting activism group, they do have an arch-rival: Team Rocket! Wait, no, DPro! D PRO came together in the 1980s and they argue that they're part of a different culture and use a different language than a hearing Japanese person does. In their minds, they're deaf first and Japanese second. They also believe that a person born to deaf parents and raised using sign-language is "more deaf" than someone who becomes deaf later in life. One of the biggest battles between them is over the definition of Japanese Sign Language. D PRO insists that there's a pure form of JSL and that it's a completely separate language from spoken Japanese and that to be deaf is to be of a different culture entirely. The JFD say signing is another form of spoken Japanese (which, coincidentally, helped to get JSL taught in public schools to deaf kids without invoking the wrath of the Ministry of Education). During one particular argument between the two groups, a member of the JFD accused D PRO of "sign fascism." You might say there's some serious tension there. Not to choose sides or anything, but as a foreigner (and a hearing person), I felt as though the style of JSL I dabbled in was distinctly Japanese. (We're still cool, D PRO! Don't hurt me!). If you want to sign "hello" in American Sign Language, you tap your fingers against your brow in a pseudo-salute. But in JSL, the sign for "hello" is holding your two pointer fingers a few inches apart and then bending them towards one another – kind of like two people bowing to each other. Of course, you've got to draw the line somewhere and even the JFD has taken issue with signs being made up willy-nilly by hearing people, particularly in the '80s and '90s when NHK started airing two television shows that featured JSL. One was called Everyone's Sign and the other was Sign News. JFD had no beef with Everyone's Sign, which taught hearing people the basics of signing. Sign News was where things got troublesome. Sign News would run the news headlines from earlier in the day and translate them into sign. The problem was sometimes there would be words in the reports for which there were no signs and the news report voice-over was so quick that finger-spelling was out of the question, so the newscasters had to invent their own signs. Then, people learning JSL or training to be interpreters would watch Sign News and later integrate the signs used on the show into their own signing. See where all this is going? There are some other interesting cases of signs being made up as well. Some deaf college students are signing in ways that reflect the onomatopoetic styling of spoken Japanese and manga. People who speak Japanese pepper their sentences with lots of interjections like そう (sou) and ね (ne). Kind of like how in English we can't, like, stop using the word like. And although a whole word can be represented with a single sign, spelling things out is sometimes necessary, like if you're telling someone your name. 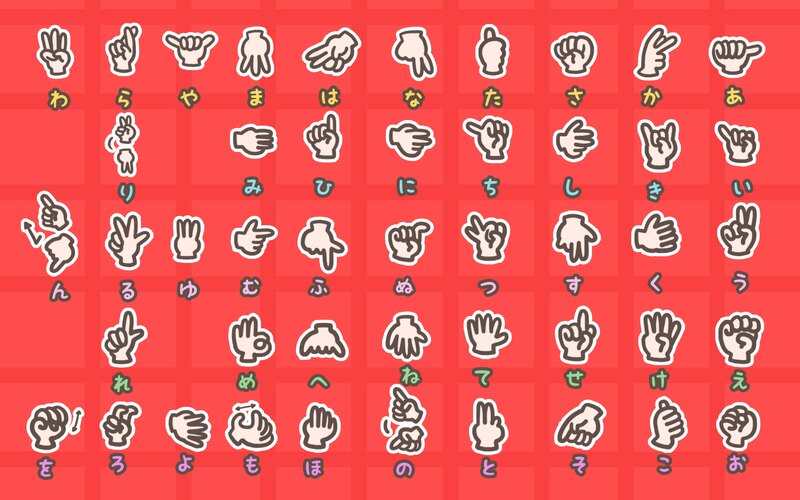 JSL has a whole alphabet of signs representing individual hiragana/katakana. And JSL learners have an edge over written Japanese learners – there's no difference between hiragana and katakana in JSL! Whether you mean や (ya) or ヤ (ya), for example, the sign is always the same: holding your pinky and thumb out and touching the fingers between to your palm. Young Japanese signers will fingerspell their conversational interjections and drag them across their body to look like the sound effects in manga frames. They might sign へへへ (heh heh heh) for a creepy laugh or さ (sa) when they're confused. (If you want to sign your own creepy laugh, the sign for ヘ (he) is basically the sign for ヤ(ya), but with your wrist bent down.) The most interesting thing here is how the sign gets positioned as if it they were in a frame of manga. It doesn't get any more Japanese than that. To keep up with all this creativity, one of the JFD's new goals became to research and create new signs for words that up until then didn't have a counterpart in spoken Japanese. About 100 new signs are generated each year and then those signs are later incorporated into the JFD's other projects, like their textbook series for JSL learners called Our Sign Language (わたしたちの 手話（しゅわ）) and their JSL-interpreters training program. They also hold training seminars throughout Japan specifically to encourage people to use these hot-off-the-presses signs (many of which are now sponsored by the government). And all of these projects help spread the use of JSL and hopefully promote a sense of community among everyone, deaf and hearing alike. As the number of sign language interpreters and signers increase, the better things seem to be getting for people who use JSL. In 2002 the National Training Institution of Sign Language was established. In 2006 Japan amended the "Supporting Independence of People with Disabilities Act" to encourage local governments to have more JSL interpreters. The future of JSL is looking up and up, and although things were pretty terrible for deaf people in Japan not all that long ago, they've made some big strides recently to help make amends. Whether they agree with the JFD or D PRO or neither, I think we can all rest easy knowing that Japanese people who are deaf are making their homeland proud. Japanese Sign Language and You! Now that you know the history of JSL it's time to take a look at the language itself. 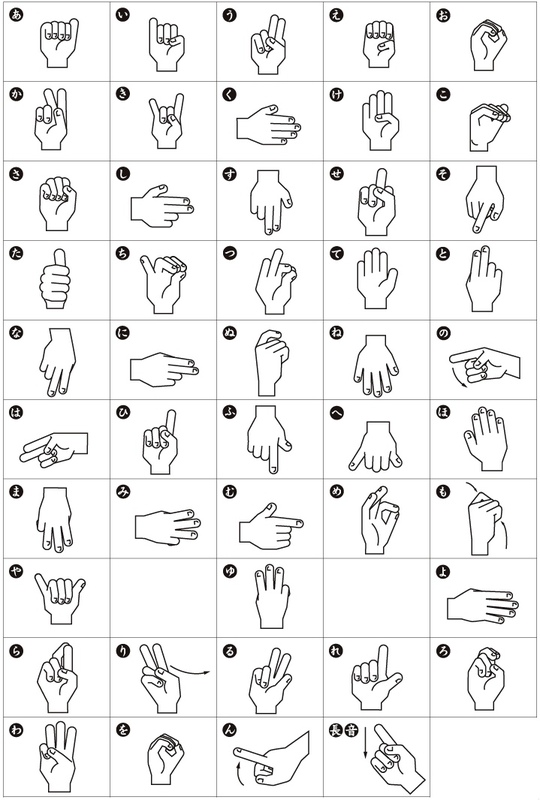 Shuwa 手話 (Sign Language) is as much a part of Japan as Shinto shrines and Kansai-ben. The people who use it daily read and often speak Japanese regardless of whether they can hear or not. Some shuwa users went to schools for the deaf, but many such schools have been closed down over the years. Now most of these people go to the same schools as any other Japanese people. For those interested in going to or living in Kyoto or Tokyo, you'll run into a few more people using shuwa; the first Japanese school for the deaf was established in Kyoto, after all. And Tokyo boasts the headquarters of the JFD, as well as a number of active college signing circles and even academic programs (Tsukuba University, for example) for shuwa users. You'll also see shuwa lessons on Japanese TV and on the railways. This is the dominant sign language of Japan. It is distinct from spoken and written Japanese, though there are influences, of course. And while there is no unique standard, just like spoken Japanese, you could say Tokyo "dialect" is the most accepted. It is not taught in schools. Unlike JSL, this MCJ is not a natural form of communication among the deaf and hard of hearing. It was banned in schools until 2002, and is sometimes taught in them now. PSJ is a contact sign language, like MSJ. It is sometimes used between non-native speakers. 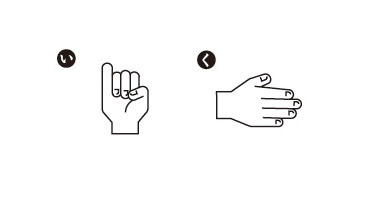 The last two are used with non-JSL users and are more similar to other national sign languages like ASL. They are basically signed versions of spoken/written Japanese. But JSL, which is considered its own language, is used by the deaf community in Japan. And you should know that at the beginner level, most of what you'll run into is MSJ/PSJ. JSL has a few different moving parts. Yubimoji 指文字（ゆびもじ） (Finger Spelling) This is just like it sounds. 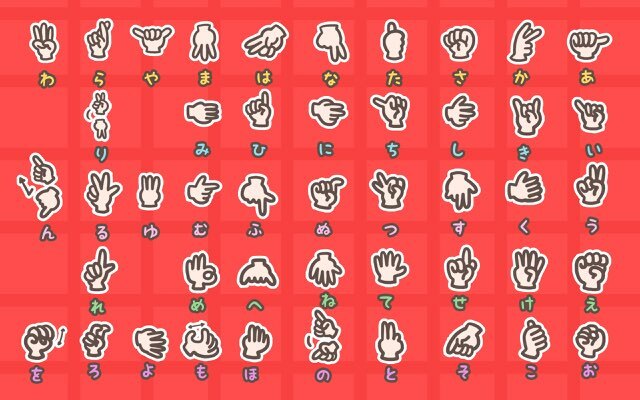 It's the Japanese alphabet with one hand shape for one sound. You use them for foreign words, last names, or strange words you don't know the sign for. Kuusho 空書（くうしょ） (Air Writing) Used for tracing kanji in the air. You probably do this already when you don't know a kanji and you're trying to explain it to someone else. Japanese people do it too. Kouwa 口話（こうわ） (Mouthing) This is a leftover from the movement back in the Taisho era when lip reading was being promoted. You mouth out kanji that have different readings to differentiate. Usually you'll mouth the first sound of each word. Just like you start Japanese by learning hiragana and basic vocabulary, most people start learning shuwa with yubimoji and vocabulary in categories like common phrases, colors, food, places, relationships, etc. But just seeing a chart of hands isn't really enough to show how it's done. There are some great lessons on Youtube that can be used to learn all of the yubimoji in a single day (if you already know basic Japanese). Scroll down a bit to see more. This can help you to learn Japanese words you're having trouble memorizing too. So think of a word you just can't seem to memorize. Now sign it! There isn't going to be one single way to learn JSL along with your Japanese. It really depends on how you're learning Japanese in the first place. If you're looking to move beyond the yubimoji, there are a number of resources you can use. And if you already know JSL or ASL and you are worried about resources using it in Japan, fear not and read on! If you live in Japan and you want to learn shuwa just google: 手話サークル to find a shuwa circle. This is probably your best bet to find people to learn and practice JSL. JSLVideoDayo: These videos teach JSL through ASL and English subtitles. Perfect for someone who knows English and/or ASL and wants to start with JSL. DeafJapanTV: Videos about a number of topics. Lessons use JSL and sometimes ASL. Some have English or Japanese spoken over them. And if you want anime content, this is the place for that. Naochannel: Lessons spoken in slow, easy to understand Japanese. There are only a few, but they can improve your Japanese listening while teaching you some basic JSL vocabulary words. HeartfulPowerHideo: Quirky videos mixed with lessons. They have Japanese subtitles and show one word lessons with multiple camera angles as well as mock conversations. ShuwaIsland: Japanese conversations, with one woman usually speaking what is being said as they sign. Also great for practicing your Japanese listening skills and studying JSL at the same time. There are lessons about Japanese culture and lots of natural shuwa conversations. MrDeaftaku: Way more advanced, but loads of material to watch to practice from. They aren't lessons, more like one deaf man's adventures for you to watch and enjoy. Hundreds of conversations! An English language website with instructions on yubimoji, common phrases, and vocabulary words. They have short videos teacher almost all of the items they teach. The same Deaf Japan that is listed above in the Youtube section has a blog where he speaks in Japanese and English about his videos. He also has charts showing ASL and JSL finger spelling. ゼロからわかる手話入門 (Comes with a DVD! Orange Days: In the words of most Japanese people I talk to about this show, it's filled with all the great and also difficult things about college life in Japan, especially when facing the dreaded job hunting, but adds in the dilemma a semi-pro musician faces now that she's deaf. Like any other language, there are dialects and regional differences, and the list of words isn't exhaustive, but this is helpful for looking up illustrations and videos of Shuwa words you want to learn. Try learning the JSL version of a word as you learn the Japanese version of a word at the same time. Or, as you make sentences in Japanese, throw in JSL words as you're speaking it out loud. Even one or two per sentence will surely help! Nakamura, Karen. The Janome Murder Incident. Deaf in Japan: Signing and the Politics of Identity. Cornell University Press, 2006. Accessed: 2015/12/11.